Are you experiencing the phenomena of “LinkedIn Guilt”? Are you comfortable using social media but when it comes to LinkedIn, you just don’t get it? If this resonates with you, then have a listen to this episode of INSIDE Inside Sales! Darryl brings in LinkedIn Megastar Daniel Disney to help you get over the hurdle of using LinkedIn. Daniel, who has almost half a million connections of his own, tells us just how easy it is to use this tool to not only source fields of new prospects, but will also give you sage advice on how you can engage with them to create lasting, trusted relationships. If you are struggling with incorporating LinkedIn into your social media outreach, this episode will both put you at ease and give you the boost you need to succeed. Daniel Disney is one of the world’s leading Social Selling and LinkedIn experts. With a LinkedIn audience of over 450,000+ followers, content reaching millions and over $32,000,000 in sales generated from LinkedIn over the last 6 years, very few out there understand it like Daniel does. In 2018 alone his LinkedIn content reached 164,000,000 people and he was crowned the 14th most influential sales expert on LinkedIn in the world. 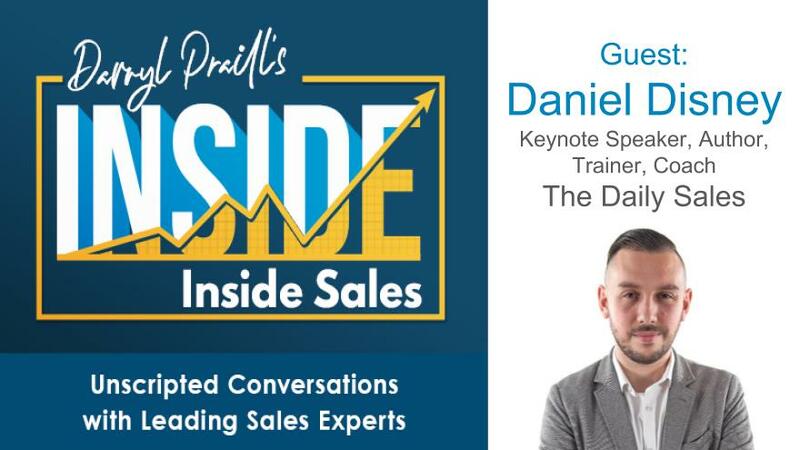 Daniel is now one of the most in-demand sales and Social Selling keynote speakers and trains sales teams all over the world how to leverage LinkedIn and Social Selling to its full potential.